The Pz.Kpfw. IV Ausf. A is a German tier 3 medium tank. The Pz.Kpfw. IV Ausf. A leads to the Pz.Kpfw. IV Ausf. D.
Good top gun for its tier, deals high amount of alpha against tier 3 tanks and lower. One tier lower than the T-28, which has similar horrible armor values. Stock gun's rate of fire rivals that of the Matildas and deals just under 25% more damage per shot. For its drawbacks, the equipment grind, and that to the Pz.Kpfw. IV Ausf. D, are on the tolerable side. Armor is an utter joke like the Soviet T-28, only slightly worse, Players not used to such armor will find it frustrating. Commander's cupola stands out like a sore thumb. Both guns have horrible penetration against higher tiers. The Pz.Kpfw. IV Ausf. 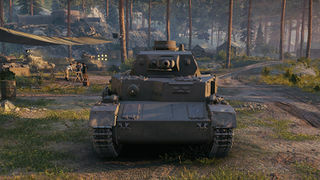 A, even though possessing the title of the earliest non-premium German medium tank in the game, can prove to be a nightmare to play for new tankers. Those who are experienced with the T-28 will have far fewer problems with this German cousin, but this tank differs from its soviet rival in a multitude of ways, each can trade blows with each other like Godzilla and King Kong, so to speak. The Ausf. A can lower its gun an additional four degrees versus the T-28, but the T-28 can elevate its gun five degrees higher. On the front, the armor of the second turret for both tanks is equal, but being a tier lower than the T-28, the turret of the Ausf. A will be less likely overwhelmed, but not by much. The Top gun of the Ausf. A deals more damage than the one on the T-28 but trades this for less penetration and an inferior rate of fire. The Ausf. A is also less bulky than the T-28, making some options that were not viable in the T-28 practical, yet it will struggle a bit to reach top speed due to the mediocre power/weight ratio. The T-28 is faster, but only slightly versus the fully upgraded Ausf. A. In addition, the T-28 has 10 extra meters of visual range fully upgraded versus the Ausf. 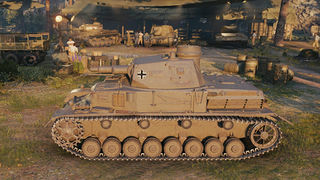 A, but the Ausf. A has superior radio range compared to the T-28 when fully upgraded. Sniping with the top gun of the Ausf. A is nearly impossible due to the poor accuracy, but is somewhat viable with the stock gun. 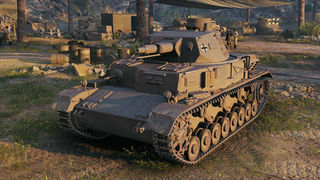 Brawling means near certain death in this tank due to the poor armor, as it will fail even against light tank autocannons in its tier, especially German ones. The Ausf. A is better suited to ambush flanking with its stock gun, coming in from the side to wreak havoc for a short while before leaving just as quickly as it appeared. With the top gun, the Ausf. A makes for a relatively good medium to short range counter-sniper, blasting at hostile tanks that use 'Peek-a-boo' tactics, especially in urban regions. But do not forget you have absolutely horrible armor all-round, so if a low tier german light, or any other tank with a good autoloader or derp gun finds you in their sights, do not expect it to save you. Keep moving, use cover (Especially indestructible walls and buildings) as much as you can, Hit enemies hard when opportunities open and then dive back into cover as soon as possible. In order to boost the agility, and thus survivability of the Ausf. A, it is best to research the top engine and upgraded suspension, which each give a boost to mobility. Research the top turret to increase armor at the front so hulldown is more of an option. Those who prefer counter-attacking tanks will want to get the top gun of this tank first, then the rest. Obtain the top radio whenever possible, as this greatly enhances your ability to remain aware of the battle situation. Lastly, research the Ausf. D, which will be a noticeable improvement over the Ausf. A. This page was last modified on 23 October 2016, at 20:51. This page has been accessed 12,339 times.